In July 1998, City Council approved the Sanitary Servicing Strategy. It puts into place a 75 year plan to provide sanitary servicing for new land developments within the City. 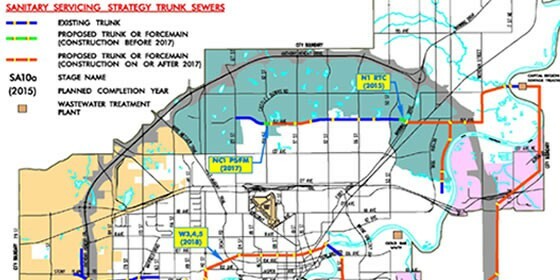 To support this plan, Edmonton asked Applications to develop a model to project the potential revenues that would be available to the City to finance future sanitary service infrastructure. This involved modeling the revenues that would be available from both the Sanitary Sewer Trunk charge as well as the Expansion Assessment Charge. This involved utilizing long term population and employment growth projections, prepared for the City by Applications, at a detailed neighbourhood basis. The analytical results of this model are used for decision making in scheduling major sanitary service infrastructure upgrades and determining appropriate rates required to finance this infrastructure.